Take a classic beef daube recipe from Julia Child and adapt it to an Instant Pot, classic cooking at its best…with basic ingredients that remind you of beef stew or white wine version of Boeuf Bourguignonne and with The Instant Pot, a beautiful new beef daube version comes from pot to company table in no time at all. I thought the cooking time was longer at 40-45 minutes for the meat, but it took 30 minutes for 3lbs. of chuck, it worked well for me in the end as it was a nice night and we enjoyed extra time out on the back porch instead of babysitting dinner. Rather than type the recipe from her first Mastering the Art of French cooking, I link to a NYT short adapted version. 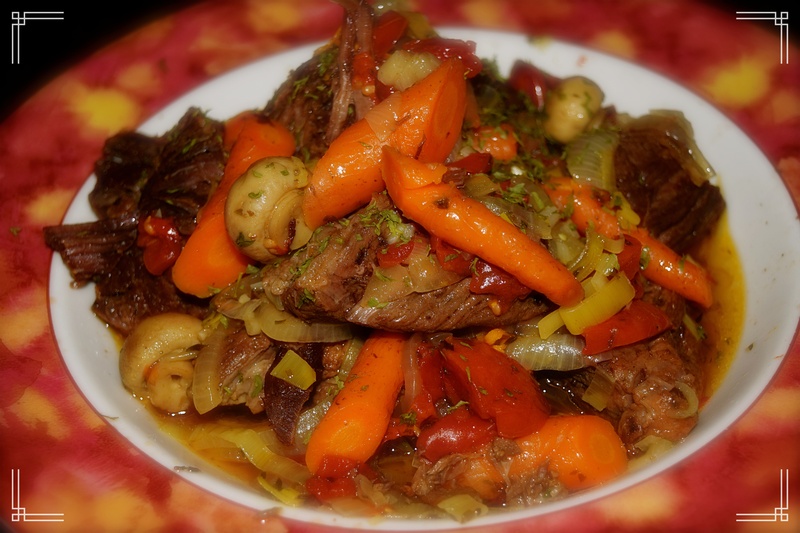 The basic steps to Julia’s beef daube is “marinating” the seasoned meat for a couple of hours in white wine, adding fresh herbs, a few select vegetables and braising in the oven or stove top for 2 1/2-3 hours. At 30-40 minutes cooking time the meat chunks were fork and fall apart tender and then another 10-15 minutes for all of the additional chosen ingredients, the pasta that I served cooked in the bubbling broth for 2 minutes. Julia would be amazed that so many people can get a pot of goodness ready while kids do homework and put a fabulous meal on the table in no time at all…no excuses other than just plain lazy with Instant Pot, I’m three recipes into this appliance in just as many days and I must say I love it! Thanks for the heads up Joyce…and there is a world of new pressure cooker recipes and guides for converting old and newer recipes, my first chili was wonderful and the soon to come NE clam chowder was very nice, truly a great new toy and to think more time can be saved when you purchase all ready prepped fresh ingredients. In the end after removing the meat and veggies to a serving platter or bowl, I thickened the pot liquid with a roux (butter and flour smooth paste). In a large bowl or sealable plastic bag, combine 2 tablespoons olive oil, the Cognac, the beef and a generous sprinkling of salt and pepper. Cover and set aside to marinate at room temperature for 2 hours. Place a rack in the center of the oven and heat to 325 degrees. In a wide, heavy casserole with a tight-fitting lid, heat remaining 2 tablespoons oil over medium-high heat until it shimmers. Add onions, carrots, mushrooms, garlic, orange zest and 2 big pinches salt; stir well to coat and heat through. Reduce heat to low, cover, and sweat (cook without browning) for 8 to 10 minutes, until onions and garlic are softened. Add beef and its marinade, tomatoes, wine, bouquet garni and peppercorns. Stir to combine. Cover and bake in the center of the oven until meat is ultratender, 3 to 4 hours. There is no need to stir or baste, but check from time to time to make sure the liquid is at a very gentle simmer; boiling will make the meat tough. When the stew is ready, adjust the seasonings with salt and pepper and serve immediately. Or, refrigerate overnight or longer, skim any hardened fat from the top, and reheat before serving. Serve over hot pasta, garnished with parsley and orange zest, if desired.